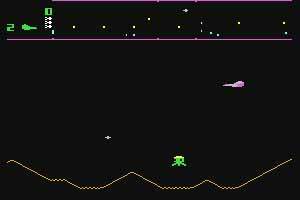 06/01/17 – Rich Stevenson confirms that Steve Evan’s original game was called Stargate, later renamed to Guardian. 20/01/14 – Confirmation that Tom Griner was the developer. Back in the 1980’s, Atarisoft were doing official conversions for the Commodore 64. Stargate was one of them! We learn of this conversion thanks to Mat Allen who has documented the conversion briefly in Digital Press. It was suggested that Steve Evans originally programmed the game for Atarisoft, but the division collapsed in the wake of the game market collapse in the 80’s. 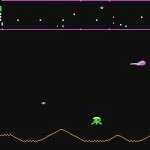 Steve then took his game and eventually had it released under the name of Guardian for Alligator Software. 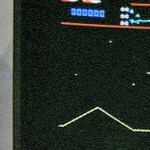 But in 2013, Kurt Woloch discovered a photo at CES84 by GCC which shows a portion of Stargate running on a C64. The game and panel looks very different to Steve Evans version, so does this confirm that Steve’s Stargate was a hack of his Guardian game? Well Rich Stevenson says that Steve gave him a copy of Stargate with that very name, to give feedback and improvements. So Steve himself did name Guardian originally as Stargate. It means that possibly Alligata probably got Steve to change the name, so they could make it an unofficial conversion. What of this other version though? It is possible that the CES photo was taken just before the gaming crash, of which this may have been a casualty and one of an official licensed conversion. 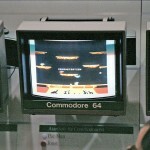 However, Jeff Minter spotted and made a connection with the Vic 20 conversion – highlighting that the score panel areas look very similar. This suggests that the game was very likely written by Tom Griner. Jeff also added that he saw an interview with Tom, where work on a C64 conversion was mentioned. Looking at Tom’s other C64 work, we can also see a slight bit of familiarity with Robotron and the Joust game which is also missing. Just how far did it reach and was this photo showing a completed version of the game? We need to find Tom to try and find out more and about what happened to this promising looking conversion. Let me throw a spanner in the works here and let you know that I actually have a copy of Stargate by Steve Evans (unreleased at the time). I worked with Steve during both his Alligata and Alternative days and Steve game me a copy of the game so I could suggest some improvements. Looks to me like the c64 in the partial screen is running Tom Griner’s code; if it is indeed Stargate on the c64 then it is likely derived from his existing Vic 20 Defender code. I saw an interview with TEG years ago where he mentions working on the c64 Stargate but I never saw his final version. Thanks Jeff! Great spot, and I think also it looks like he may have been involved on the conversion of Joust that never got released. Certainly I believe the Stargate game in GB64 is a hack of Guardian. Whether it started out as an official conversion is up for debate. I’m not entirely convinced. I’d be surprised as well if it was official! Thanks Kurt! Added to the entry and left the question open now if the Stargate game we have there was in fact just a hack. Again, this may have been a casualty of the gaming crash.